Wall relief depicting the “God of Light” (aurora) Amun offering the symbol of life (ankh) to Ramesses III (guise of Mars). Medinet Habu, Egypt. As proposed in my books and throughout my web, planetary chaos saw the plane of the ecliptic besieged with countless tons of dust, gasses and debris – this a natural consequence of any given comic catastrophe. From the perspective of earth, the ecliptic dust hazed the Sun red exactly as depicted on almost every tomb and temple wall the length and breadth of the Nile valley. A diminished red sun also allowed the Egyptian’s the luxury of wearing nothing more than a loincloth throughout the year, again exactly as portrayed (see Red Sun). Throughout the Pharaonic period (3,000 years) tons of debris fell into the Sun’s atmosphere resulting in Coronal Mass Ejections, solar flares and prominences on a scale we would find difficult to comprehend. Courtesy of a red Sun this ‘lashing out’ was clearly observed and duly represented by the cobra which spat fire against Egypt’s foes. This being the very reason why the Egyptian Sun was many times depicted with a snake draped over it. This ‘feeding frenzy’ dramatically increased the solar wind and gave rise to intense geomagnetic storms and global auroras unlike anything experienced in modern times. 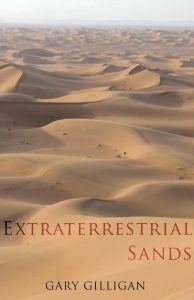 They were not restricted to the Polar Regions; they were a truly global phenomenon, observed at all latitudes especially during the night and at times, even during the day. The hazed red Sun, once again, granting visibility to the otherwise invisible. These magical dancing neon lights were personified in the great Egyptian god Amun. Before we proceed I would like to point out, in my latest book Comet Venus I dedicate over forty pages to physically identifying the Egyptian “king of the gods,” Amun as an auroral phenomenon. This page is to be seen as providing corroboratory support for this. Is is also presumed the reader has a basic understanding of the God King Scenario. Amun (Amen, Amon) was the king of the gods. The name means ‘The Hidden One’. Amun is most commonly shown entirely in human form. Often he is standing or sitting on a throne wearing a red, flat-topped crown with two tall plumes and holding a sceptre in his hand. Amun can also assume the appearance of a ram, his sacred animal. His sacred colours were blue, red, yellow and green and his images are to be found throughout the Nile Valley. Two images of Amun sporting two tall plumes or feathers. These are very important for as I will shortly show they are actual physical representations of Auroral lights. The enormous temple complex of Karnak was the principal home of Amun where he was worshiped as the prominent divine entity. During the New Kingdom, his popularity eclipsed that of other major deities; he was the ‘king of the gods’. The warrior-god Montu was believed to be a manifestation of Amun. A Theban triad consisted of Amun, his wife Mut, and their offspring Khonsu, the moon god. All three had temples at Karnak. Amun is a god whose attributes are so extensive it lacks the personality of other deities. His role as creator is emphasised in many hymns. He was believed to be self-generated. As a fertility god, he impregnated his mother, the Celestial Cow, to ensure the fecundity of animals and plants. He was closely involved with kingship, and many pharaohs regarded themselves as one of his incarnations and incorporated his name into their own (Tut-ankh-amun). 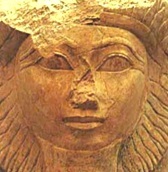 Amun was also seen as the divine consort of Egyptian queens (‘god’s wife of Amun‘). 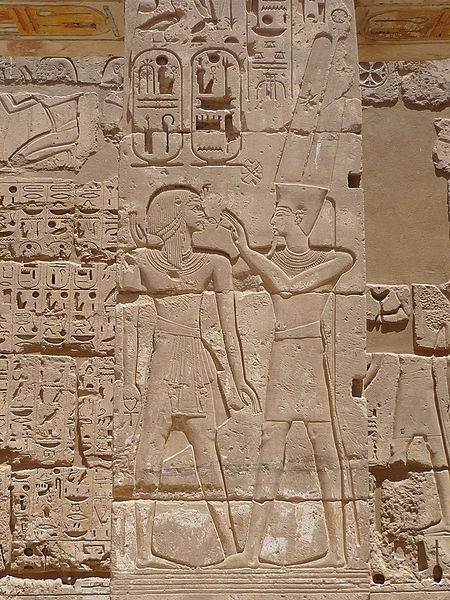 Queen Hatshepsut (right) presented herself as an offspring of the god during a visit to her mother. His virile strength made him an appropriate deity for ensuring military victory for the pharaoh. Amun was invoked for healing from the bites of dangerous animals and other illnesses. During the New Kingdom, he was a personal-saviour god of ordinary working people, as numerous devotional stele testify. 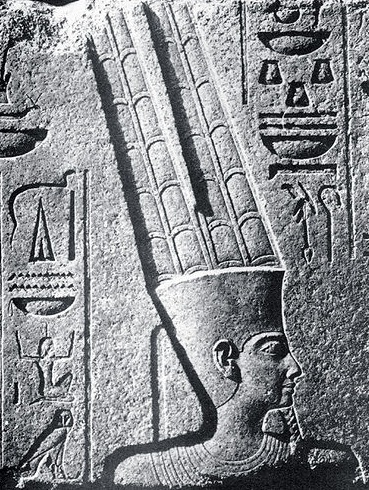 Amun later became synchronised with Re to become Amun-Re. Many catastrophist writers have attempted to give physical identity to Amun by placing him in the world of chaos. One of the most widespread identifications is the linking of Amun with Jupiter. This is because Jupiter is the largest planet in the solar system and, since Amun was referred to as the ‘king of the gods’, Amun must therefore be Jupiter. This is an unsatisfactory explanation and exhibits a lack of knowledge about the ancient world. How could ancient people possibly know that Jupiter was the largest planet? From Earth it is a mere speck of light in the night sky. It is not even the brightest ‘star’. Excluding the Sun and Moon, the brightest light in the sky is Venus – why wasn’t Venus deemed king of the gods? What of the bright star Saturn or even Mars? If Amun was Jupiter, how do we explain Amun’s tall feathery plumes, his sacred colours, his syncretism with Re (Amun-Re) and epithets such as ‘one whose true form could never be known’? How can any of these apply to Jupiter? Egyptologists fair no better. They understand Amun’s role in connection with the monarchy, but what is the meaning behind his strange plumes and curious epithets? Their best explanation is to present him as a solar deity – once again they point to the Sun. The key to physically identifying and understanding Amun lies with his unusual, tall plumes and the colours contained within. They were direct representations of magical celestial lights that were observed the world over in ancient times – a phenomenon we call the Aurora.